Caramel Wings: Of Procrastination, Inspiration, Recognition, Friendship, and a resulting Egg Masala. 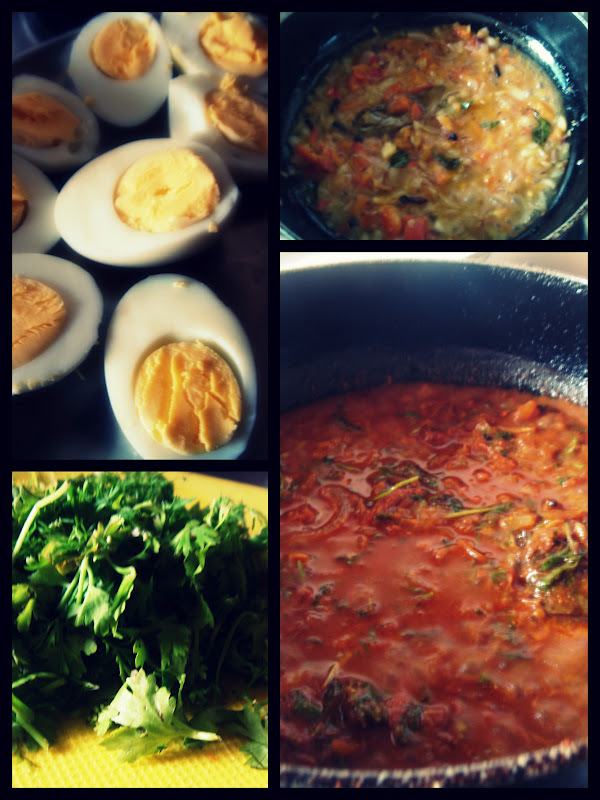 Of Procrastination, Inspiration, Recognition, Friendship, and a resulting Egg Masala. Sharing is Caring. Whenever it comes to food, especially. I have always been intrigued with this fad of "secret recipes" especially with people who commercially sell their food, but with time and through experience I have learned that sharing it all does not steal anything from you or the way you would cook a recipe. I, for one, do not remember the last time where I would have followed a recipe to the T. I have always done something to add my little twist to it, or gone with my instinct and trusted my gut. There were times where I went against it and tried to stick to the recipes but that has never worked out for me, and the Chocolate Eclair Episode is a standing testimony to that! What I actually want to convey here is that if you share your knowledge, you are bound to get it back multi-fold. Just like that, my school friend Rashmi (who posts amazing pictures of food on her Facebook Timeline) once put up a picture of Egg Masala. I'll let the picture do the talking here. After few minutes of ogling at the picture and realizing that I was drooling, I went ahead and asked her for the recipe and like a true friend (True Friends are the ones who share recipes) she immediately inboxed me the recipe. But then I also had to live up to my other duties like playing Queen of Procrastination so it just went down one day at a time in my list of facebook messages and I forgot about it. But thanks to my specific cravings, I was craving for exactly the dish from the picture and I just had to make it. Until I got lazy again. So I logged on to twitter to rant about how I was not feeling very inspired to cook anymore but I checked my mentions and could not stop smiling ear to ear coz Burrp Mumbai featured me on their list of 6 Foodies to follow in Mumbai, along with some pretty amazing Foodies! Here is the link to the article! Well, that gave me the much needed push and off I went to the Kitchen! Heat Oil/Ghee on medium heat in a pan. Add Bay leaves, Cinnamon, Carom Seeds, Cloves and sauté for a minute. Next, add in the Cumin seeds, Curry Leaves and the chopped Onion. Sauté until Onions are soft. Add in the Tomatoes and Mint Leaves and add half cup water. Cook till water evaporates, while stirring occasionally. Do mash the Tomatoes as you go along while stirring. Add in the Chili Powder, Turmeric Powder, Coriander Powder, Meat Masala/Garam Masala and fry till fragrant (About 90 seconds), then add in the remaining half cup of water and half of the Coriander Leaves. Cook till the gravy reduces to desired consistency, you could add more water if you like. Finally, add in the boiled Eggs and Salt to taste, (I sprinkled some Garam Masala here too) and Garnish with the remaining Coriander. 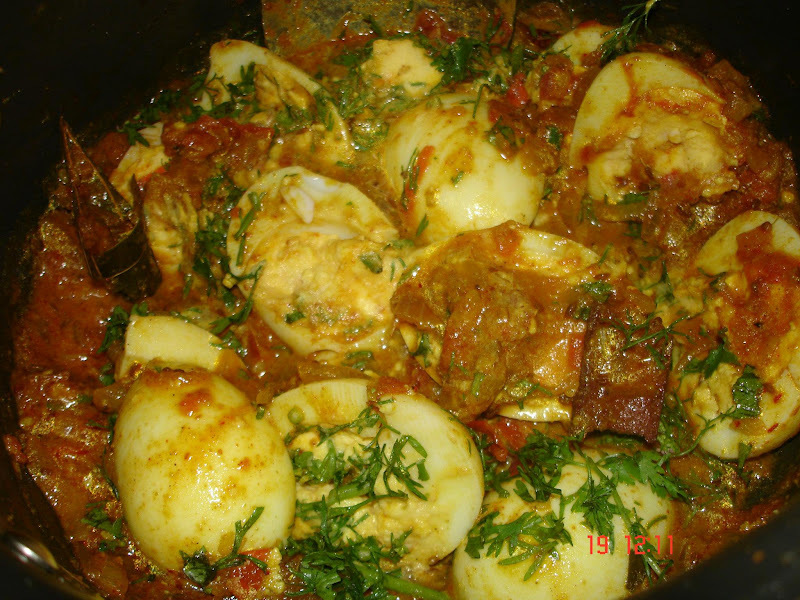 Serve with Roti/Rice. I personally felt that it tasted best when it was not piping hot. Have it when its warm and you would be able to savour it better. The aftertaste of the Carom and the Minty feeling is something quite different and you would definitely go out for seconds! Thanks again Rashmi I will be cooking this fairly often now! Yay! Congrats on the burrp mention. Way to go girl!! 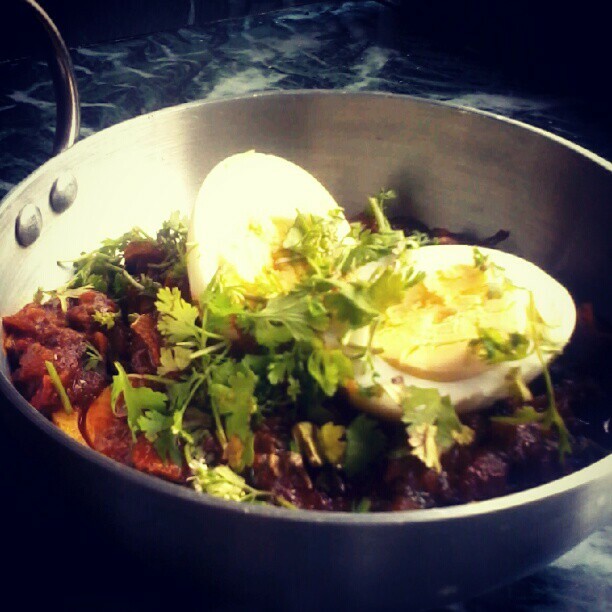 This egg masala ooks mouth wateringly good. Would love to have it with hot steamed rice. yum yum. I am running towards your blog right now!! :D Thanks in advance!